The CUBE Cart from Bretford is a simple, affordable, no-frills store and charge solution for your Chromebook, laptop and tablet devices. 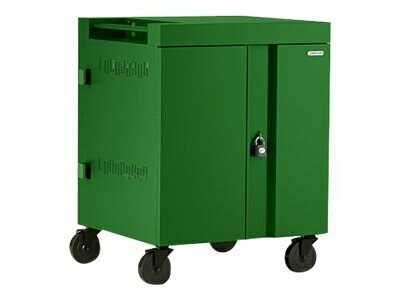 With easy access AC charging outlets, durable all-steel construction and full certification to the UL-60950-1 safety standard, the CUBE Cart has the standard features and quality you've come to expect from Bretford. Dividers provide storage and feature routing slots for power cables to keep things organized and neat. A removable rear panel provides quick and easy access to AC power outlets and adapter storage. A key lock located on the top of the rear panel helps secure your adapters while a reprogrammable combination padlock helps secure devices from the front during charging.